Most people have two kidneys, which are organs shaped like kidney beans, each one about 10-15cms long, located either side of the spine, deep in the abdomen. However, it is possible to live a healthy and active life with only one functioning kidney. In rare instances people can be born with three kidneys, and likewise remain healthy. 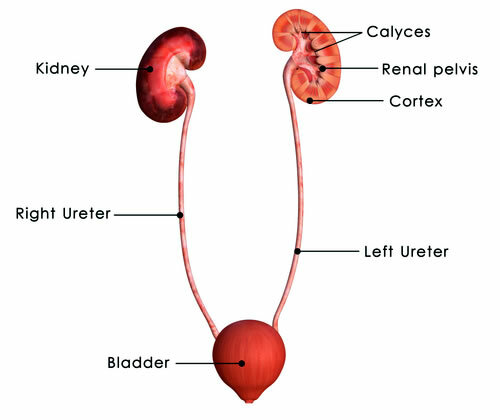 The ureters connect the kidneys to the bladder. The main function of the kidney is to filter the blood of toxins and transform the waste into urine. The kidneys also produce hormones that help to control blood pressure, boost the production of red blood cells and help keep bones healthy. Each kidney weighs about 160 grams and gets rid of between one and one-and-a-half litres of urine per day. The two kidneys together filter 200 litres of fluid every 24 hours. Kidney problems are common. When the kidneys fail, waste products and fluid build-up in the body, making you feel unwell, gain weight, become breathless, and get swollen hands and feet. Occasionally, if kidney damage is severe it can lead to high blood pressure, anaemia and bone disease. 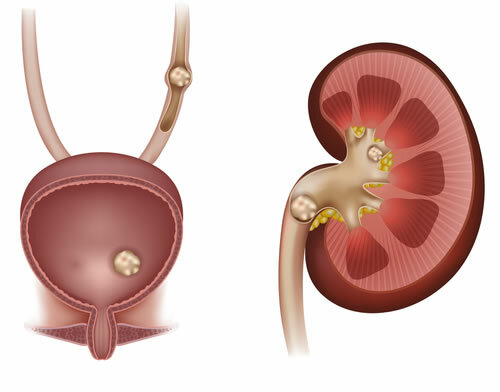 Kidney stones are a collection of crystals that can develop in one or both kidneys. They vary from the size of a grain of sand to a golf ball. Small ones generally pass out with the urine. Although they don’t cause any serious problems, this can be very painful. Bigger stones can get stuck in the kidney or block the ureter (the tube from the kidneys to the bladder). This causes intense pain in the back or side of your abdomen, which may spread into the groin. Kidney stones are quite common and usually affect people aged 30 to 60 years. They affect men more than women. It is estimated that renal colic affects about 10-20% of men and 3-5% of women. If you pass a renal stone, your lifetime risk of producing another stone is approximately 50%. Risk factors include: diet, obesity, hydration status and genetic factors. On average, we can treat any acute kidney stone within 24 hours from diagnosis. If a stent is placed in the ureter/kidney; we ensure that it is in place for the shortest time possible before safely removing it under local anaesthesia. Full metabolic screening and nutritional support are established services offered to all our stone patients. Patients with recurrent stones will be given a treatment passport to allow the fastest possible access to our services in urgent or emergency situations. 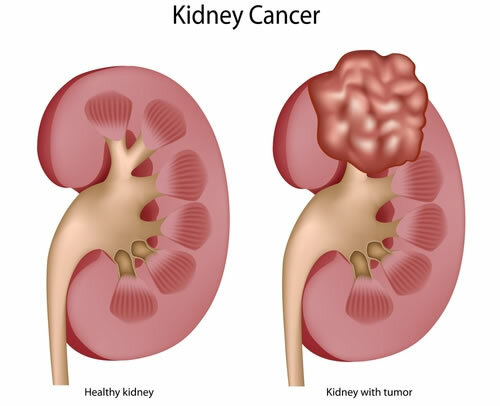 Kidney cancer accounts for 4% of all new cases of cancer diagnosed in men, and just over 2% of all cancers in women in the UK (excluding non-melanoma skin cancer). Increasingly, incidental asymptomatic kidney tumours are being detected by doctors investigating patients for non-related illnesses. These are usually picked up on ultrasound or CT scanning. It has been estimated that the lifetime risk of developing kidney cancer is 1 in 56 for men and 1 in 90 for women. It most commonly occurs in people aged 45-75 but can affect children too. Symptoms that can occur include haematuria (blood in the urine), pain in the back, abdomen or flank. Rarely, we may observe alterations in either liver or kidney function on blood tests. Previous radiotherapy for testicular or cervical cancer (cancer of the neck of the womb) may slightly increase the risk of developing kidney cancer. The world’s most comprehensive precision oncology test using novel gene sequencing techniques to identify the specific genetic mutations responsible for your cancer development and growth. These results are then matched to personalised, next generation cancer drugs to target your cancer. An obstructed kidney is also termed hydronephrosis. An obstructed kidney continues to produce urine and the build-up of urine within the kidney increases pressure within the kidney. The blockage can be due to an extrinsic (outside the urinary system) or intrinsic (inside the urinary system) cause, affecting one or both ureters at any level between the kidney and the end of the urethra (water-pipe). Occasionally, if both kidneys are obstructed then patients can suffer an acute kidney injury and possible renal failure. If the blockage is undiagnosed and associated infection occurs the pus can form quickly causing patients to become very ill.